During the day two 'lads' came and grouted all the pathways laid by Billy "No Mates" last week. This past week we have had almost daily visits from Daniele (architect) and Donato (foreman) who is directing the lads. The various bits of wiring, plumbing and plastering continue but not at the same frenetic pace of last Monday. In the evening we had our very first dinner party in Puglia. Christine, a tutor on Mary's NLP course, lives the far side of Ostuni about 15 m (24 km) away. So we called and invited her and husband John over for supper. John's GPS was able to confirm our exact location as N 40° 45' 912", E 17° 22' 604" and elevation as 480mt above sea level. We have a mystery tree in our garden. We could identify all the other trees (olive, green fig, black fig, almond, apple) but not this last tree. I could not believe a farmer would plant anything unless it had some utility value. 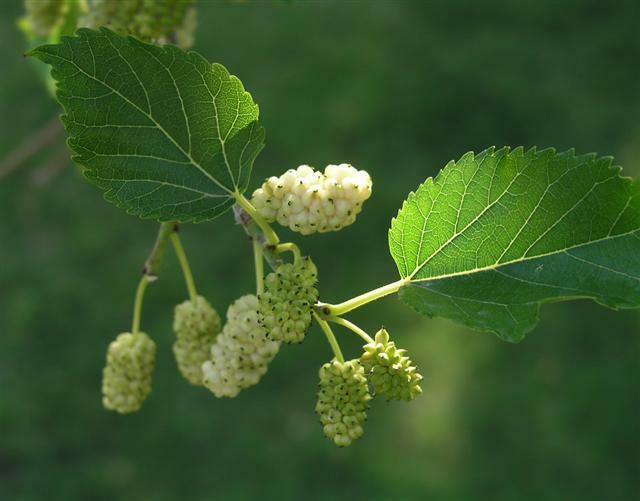 John was able to identify it for us as a white mulberry. The grub-like fruits are very tasty and would, I imagine, make a delicious crumble or flan. We served a simple supper of cherry tomato, mozzarella and rocket (US: rucola) followed by grilled chicken (marinated in olive oil, lemon juice and garlic), fried mushrooms and peppers and capers. We chatted away till midnight when our guest left with a return visit arranged for Thursday. Thought you might like to know that mulberrys are a very common bacyard tree in Australia and have a number of uses. Firstly of the culinary nature (usually jam, but yes, also flans and pies), and secondly for their leaves. Mulberry leaves are what silk worms eat, and it is a common passtime for Aussie children to keep a box of the grubs and feed them leaves until they produce their cocoons (which are unravelled and made into silk).